The Moto X is the first Android phone in a long, long time that I have actually wanted. If you’re tempted to stop reading right there because you think this is going to be another biased fanboy rant, stop right there. My primary phone is an iPhone 4S and the next phone I buy will be another iPhone. Motorola isn’t paying me and I don’t have a gun to my head. I really do like this phone and I think you should too. I think this is going to be the first Android phone since the Droid or the Galaxy S where people will be proud to say that they have this phone because their friends have it too. The Moto X is distinct from the Droid and the Galaxy S (and its successors) in that it offers a level of customization yet consistency that enables a sense of community and individuality at the same time. Like the S4, they’ll be able to walk into any carrier and buy it. Like the iPhone, there are simple options and a built in level of customization to make up for the lack of accessories that iOS users use to create a sense of individuality. In short, it takes the customization that Android is well known for and packages it in a way that I think people will be proud of. This phone is coming at a time when the spec wars have effectively ended, which enables Motorola to emphasize what actually matters: software. A lot of people appear to be complaining that the Moto X has mid-range specs. The truth of the matter is that mid-range specs have been more than enough for a top-tier phone for a long time, but Android hasn’t been ready. Android devices are somewhat notorious for having issues with framerates, IO performance, and general lag. Many users reported having issues with a phone slowing down with use. While I definitely had many of those problems, I always attributed it to running custom ROMs or my perception after seeing newer hardware. I can remember being frustrated that iOS users often had superior performance despite having less RAM and a slower processor. It turns out that Android needed some enhancements to deal with those issues. Starting with Android 4.1, the Android team began to address performance issues dealing specificaly with framerates through Project Butter. In Android 4.3, Google has added TRIM, which greatly enhances IO performance. Between increased framerates and better IO performance, Android should be feeling better both out of the box and after being in use for months at a time without a wipe. While the Moto X isn’t launching with Android 4.3, it is launching at a time when Android has reached enough maturity so that having an insane processor and tons of RAM isn’t necessary. Obviously having top of the line specs does help, but the vast majority of people don’t need a phone with top of the line specs. What they need is a phone that will perform well over a two year contract. I have no doubt that the Moto X can be that phone for most Android users, especially after it receives Android 4.3. This is something that I’ve wanted for a long time. For Android enthusiasts, Android has always been about being able to customize the phone to your liking. A lot of the debate between iOS and Android enthusiasts has been about the level of customization available to each user. A lot of the debate centered around the idea that if you want a simple phone that is easy to understand, you get an iPhone, but if you know what you’re doing then you get an Android phone. While I have a lot of scruples with that idea, I get it. I’ve spent many hours customizing my home screens with widgets and icon packs and launchers and tweaks only to flash a totally different ROM on my phone to enable slightly different tweaks. The Moto X takes that kind of a obsession with software design customizations and brings it to the hardware. While the customizations are essentially limited to colors and engravings, I love the idea of being able to select the colors I want for my phone. I think giving people tons of options to color their phones and have them shipped to your home in 4 days is going to resonate well with consumers. People already buy cases and covers for their phones to make their phone feel more personal; personalized color options takes that to the next level. The Moto X is not shipping with stock Android, but the customizations they have added are designed to enhance and simplify the phone. These aren’t gimmicks like pausing video when you look away; these are real features that change the way you use the phone for the better. Like I said on the Droid Life Show, I think the ability to launch the camera with the flick of a wrist will be an amazing feature for enthusiasts, moms, students, and everyone in between. The fact of the matter is that people want to be able to take good photos quickly. The Moto X doesn’t come with the best camera on the market, but from what I’ve seen it takes good shots and the interface is brilliantly simple. Tap to shoot, swipe from right to left to enter Gallery, swipe from left to right to adjust the camera settings. Most people don’t want to have a million options when taking a picture. They may want to make some edits before posting a picture to Instagram, but other than that people just want to take a photo to remember a moment. Active Notifications are another software enhancement that I find ingenious. I personally hate a notification light for two reasons. First, it just keeps blinking at me to tell me something I usually already know: I have a new notification. I don’t need a constant reminder. Second, while some phones allow a great deal of customization in terms of notification light colors and blinking patterns, I still find I would rather know precisely what the notification is so I can decide if it warrants my attention or not. Some of Nokia’s phones have implemented a similar idea for showing bits of information on the screen without lighting up the whole thing. Motorola takes this a step further by adding functionality to respond to notifications in an intelligent manner with swipes. Voice recognition integrated with Google Now is another feature that I think is innovative, but probably not life changing. I like that you can train the Moto X to listen just for your voice. If anything, having voice recognition prepares for a future where multiple humans in one space are trying to use Google Now with their voice. While I’m praying that history does not go in the direction of people talking at their phones in public, I still think this is a neat way to give voice feedback more security than other intelligent assistants (I’m looking at you, Siri). The Moto X is not the best Android phone if your expectations include the best processor, the best display, stock Android, and no carrier interference for updates. If that’s what you want, then keep dreaming. If, however, you want a phone lets you customize its hardware and software, has pleanty of power, and is going to be available on every major carrier, then I think you ought to consider the Moto X. There will always be another phone with a higher resolution screen or a processor with more power than you need or more megapixels. If you want power and top of the line specs, go get an S4 or a One; you’ll be happy with either phone. The Moto X isn’t about overwhelming you with specs; it’s about meeting your needs as a device while tailoring itself to your aesthetic tastes. 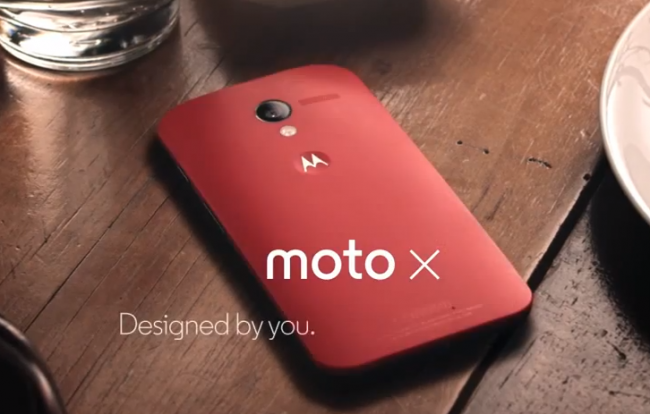 The Moto X really is the first phone that can be designed by you in a meaningful way.